March 25 (Reuters) - SouthGobi Resources Ltd, a Canadian coal miner with operations in Mongolia, said it could default on a debt repayment and was looking to raise money, sending its shares down as much as 29 percent in afternoon trading. The company, controlled by Rio Tinto Plc through its unit Turquoise Hill Resources Ltd, also reported a bigger quarterly loss, mainly due to impairment charges. A delay in securing additional financing could result in a default of $250 million debentures held by China Investment Corp, SouthGobi said in a statement on Monday. SouthGobi shares plunged to 52 Canadian cents in afternoon trading, making it one of the biggest percentage losers on the Toronto Stock Exchange. The company had working capital - the difference between current assets and liabilities - of $41.7 million as of Dec. 31, compared with $120.4 million a year earlier. As of March 24, the company had $10 million cash on hand. SouthGobi said it expects liquidity problems to continue and margins to remain weak as coal prices are likely to stay anemic in China this year, echoing U.S. rivals such as Alpha Natural Resources and Arch Coal Inc.
Producers of metallurgical, or steelmaking, coal have been hit by weak demand amid slowing growth in China. SouthGobi is being investigated by Mongolia's Independent Authority Against Corruption (IAAC) and State Investigation Office (SIA) for possible breaches of anti-corruption, money laundering and taxation laws. The company said on Monday it had received a notice from the Mongolian authorities that might lead to criminal actions against three of its former employees and SouthGobi could be held liable as "civil defendant". The company's net loss widened to $138.7 million, or 75 cents per share, in the fourth quarter ended Dec. 31, from $56.6 million, or 31 cents per share, a year earlier. SouthGobi took impairment losses of $106.8 million in the quarter. The company reported revenue of $32.5 million. SouthGobi reported revenue of $1.2 million in the year-earlier quarter, hurt by suspension of production at its flagship Ovoot Tolgoi mine in Mongolia. The company's shares had fallen about 65 percent in the past year, excluding Monday's losses. The stock underperformed the TSX-Toronto Stock Exchange 300 Composite Index, which had risen about 12 percent in the same period. VANCOUVER, BC--(Marketwired - March 25, 2014) - Turquoise Hill Resources (TSX:TRQ, NYSE:TRQ, NASDAW:TRQ) will announce its financial results for the fourth quarter and full year 2013 on Wednesday, March 26, 2014. VANCOUVER, BRITISH COLUMBIA--(Marketwired - March 25, 2014) - Kincora Copper Limited (the "Company", "Kincora") (TSX VENTURE:KCC) is pleased to announce that it has completed a $5 million private placement, subject to certain approvals. The successful placing attracted considerable demand from both new and existing investors and was significantly oversubscribed. Funds from the capital raising will be used for high priority drilling, and other exploration activities, at our flagship and wholly owned Bronze Fox license in the upcoming 2014 field season. The Company has closed the first tranche of financing for gross proceeds of C$4,575,000 through the issuance of 91,500,000 units at a price of C$0.05 per unit (the "Offering"). Each unit consists of one common share and one common share purchase warrant. Each whole warrant entitles the holder to acquire one common share of Kincora for a period of two years expiring March 24th, 2016 at a price of C$0.105 per share. If at any time following the expiry of the resale restrictions the closing price of Kincora's shares on the TSX Venture Exchange (the "TSXV") is greater than $0.15 for 30 consecutive trading days then Kincora may give notice accelerating the expiry date of the Warrants to 30 days from the date of the notice. All units issued under the Offering are subject to a four month hold period expiring July 25th, 2014. The Company paid finder's fees of $190,642 in connection with the first tranche of the Offering, with efforts led by the The Private Office SA ("TPO") and Resource Investment Capital Limited ("ResCap"), and assisted from SkyPath Partners LLC, Pareto Securities Limited and The Mongolian Investment Banking Group LLC ("MIBG"). The Company proposes to issue a further approximately 8,500,000 units for proceeds of approximately $425,000 to Khayyam Minerals Ltd. (TSX VENTURE:KYY.P) ("Khayyam"), which issuance remains subject to Khayyam obtaining certain regulatory and shareholder approvals, as more particularly detailed in the news release of Khayyam dated March 10, 2014. "Kincora attracted significant demand for the Offering, which has been well oversubscribed, illustrating strong interest and support for our proposed field season activities at Bronze Fox. I would like to welcome a number of new investors, some of which are mining sector and/or Mongolia specialist groups, who participated in the private placement and thank existing shareholders for their continued support as we enter a very exciting period for Kincora. The Company's focus is now mobilizing field season activities and advancing a number of corporate initiatives. Drilling, and other follow up activities, are shortly planned at Bronze Fox based on extremely promising previous drill results, new geophysical and other "long lead" time / technical activities undertaken in 2013. A follow up phase of target drilling in 2001 at Oyu Tolgoi focused on similar untested geophysical targets, with often-supportive previous drilling, and led to the "discovery hole" and subsequent definition of one of the world's largest copper-gold porphyries. Kincora is looking to follow a similar exploration strategy and successful proof of concept activities at Bronze Fox this field season could provide visibility for significant resource potential." Xanadu Mines Investor Presentation, Mines & Money HK 2014: "Unlocking Mongolia's Copper Belt"
March 25 -- Attached is a copy of the presentation to be made by Xanadu Mines (ASX:XAM) Managing Director, George Lloyd, at the 2014 Mines & Money Conference in Hong Kong. Aspire Mining Investor Presentation, Mines & Money HK 2014: "The Ovoot Coking Coal Project"
March 19 (BCM) Mongolia's rail construction between Mongolian Mining Corp.'s Ukhaa Khudag mine site and the Chinese border is nearly a quarter of the way finished, but additional rail lines to run are still are a long way from being funded and years from being finished, said a Mongolian rail official. According to A. Zorigt, who is leading the project for state-owned Mongolian Rail, last year saw the completion of 24 percent of the 267 kilometers of rail to be built – including 70 percent of the soil prep work. Korea's Samsung C&T is leading the construction work of railroad from Ukhaa Khudag to Gashuun Sukhait. "The earth work will start again in the end of this month, and we plan to get the finished railroad by November 2015," said Zorigt. Samsung has contracted 11 Mongolian firms and one Chinese for 267 kilometers between Ukhaa Khudag and Gashuun Sukhait, as well 1,600 kilometers to Mongolia's eastern region. With investment costs totaling between USD 5 billion and USD 6 billion, the private-public partnership agreement made will leave the state with 51 percent ownership of the railway built, with foreign partners to own the remaining 49 percent—including Britain's Ashmore Group and a Russian firm [Source cites the company "Eurasia" -ed]. Mongolia will utilize USD 200 million from the Chinggis bond to finance its portion of the costs, he said. Construction is expected to complete three or four years after investment is made. "Before raising the foreign investment the remaining USD 200 million from the Chinggis Bond is essential now for continuation of our project, said Zorigt. Zorigt said he expected returns on investment to arrive after nine years, with 13 percent annual profits to follow. However, before Mongolia can reach that point it will have to figure out how to sell the project to the local communities. "Currently the main obstacle for the railway projects is financing, resistance on freeing the land and the wrong understanding of the people, and issues of land payment." He said costs to local authorities would likely be up to MNT 7 million per cubic meter of land for around MNT 10.4 billion. He added that local governments reduced costs 65 percent for roads, but did not support a proposal for a similar scheme for the rails. • Turnover of the Group in 2013 was HK$14,093 million, a 13.77% increase over 2012's turnover of HK$12,387 million. • Loss attributable to equity shareholders of the Company was HK$1,789 million in 2013. In 2012, the loss was HK$1,491 million (restated). • Diluted loss per share was HK$0.474 for the year ended 31 December 2013. • The Board does not recommend the payment of a final dividend for the year ended 31 December 2013. In 2013, we procured a total of 5.12 million tonnes of Mongolian coal, a 19.07% increase from the volume procured in 2012 (4.30 million tonnes). With this increase in procurement volume, the Group managed to maintain its business operation in many strategically important ports, railway, and logistic parks. The Group believes that these assets would bring value to the Group and significantly increase the Group's market share once the coal sector is recovered. Note: Coal purchased from Moveday was mined by Tavan Tolgoi Corporation. Moveday also provided transportation services amounting to HK$303 million to Winsway in 2013. The Company has a well-diversified base of Mongolian coal suppliers. Turquoise — still the colour of money in Mongolia? March 25 (FT Alphaville) Decision time approaches for Mongolia, Rio Tinto and Turquoise Hill on Oyu Tolgoi, the enormous copper mining project that could one day represent about a third of the landlocked nation's economy. Since we reported that Mongolia's yet to be created sovereign wealth fund could take an equity stake in Turquoise (which releases earnings after the close in Toronto on Tuesday), one deadline has been extended, the mining minister has done his best to wind up investors, China has reasserted itself and Tony Blair has popped up. All of which means that a deal to start work on the underground part of the mine (phase II), funded by $4bn of loans by commercial banks and multilateral lenders, is very close. But it remains caught up in Mongolian politics, and may not hit the March 31 deadline on which the funding hangs. To deal with those loans first. The agreement with the commercial banks is good until Monday. The World Bank's International Finance Corporation and the European Bank for Reconstruction and Development had set a February 24th deadline for their involvement, but this was kicked out to March 31. Rio and a team of Mongolian negotiators led by a former politician have pretty much nailed down the terms of their agreement, and could have some sort of memorandum of understanding and completed feasibility study ready to go by Monday. We also understand that Tony Blair — who has form in helping big mining deals get past a late-stage impasse — has told the Mongolians that the deal is fair, although in an unofficial capacity only. Officially he is in the country advising on a governance project. However Rio needs/wants someone with clout to sign the agreement, such as the prime minister, before they start digging on this. Which brings us to the mining minister, Gankhuyag Davaajav. "He really went out of his way to be a dickhead." When Gankhuyag was first appointed he said he would renegotiate the underlying investment agreement that specifies the ownership and royalty structure for the mine, or resign. Rio has point blank refused, and he has since rowed back from that, but continues to be noisily opposed. While not actually being part of the negotiations, the mining minister represents a significant political constituency that is seen in some quarters as an obstacle to getting the deal done. Further stirring the pot, Mongolia's Minister for Foreign Affairs Bold Luvsanvandan appeared in Sydney last week and told Reuters that it will all come together when the next parliamentary session starts on April 5. While not involved in negotiations, he is in the cabinet, but then again has since rowed back from that statement as a gaffe, according to locals. So what is clear is that the Mongolian political situation is not. Prime Minister Norovyn Altankhuyag seems likely to face a no confidence challenge when parliament returns. One way to avoid taking the blame for signing or not signing an Oyu Tolgoi deal — he'll be attacked either way — would be to present it to parliament for approval. That way the country's politicians have to hold hands and jump together. Political victory and happy Rio. Change the cost of capital, and might y0u then affect the feasibility study on which the Mongolians appear to place a lot of stock? The whole project is delayed once more. Meanwhile the importance of the mine to the future of the economy has lessened as China has opened its checkbook to help out a neighbour. The PBoC has doubled its swap line, to about $3.2bn, removing the risk of foreign currency liquidity problems for the government. China also plans to build four coal to gas plants in the country, at an estimated cost in the region of $30bn (or two years' worth of current GDP). 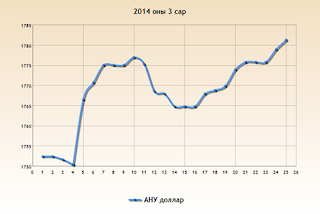 The Turquoise Hill share price still remains one of the best indicators for investor sentiment towards Mongolia. Were the country's sovereign wealth fund to take an equity stake, it would be an important signal about future property rights, the country's "third neighbour" policy (please don't leave us reliant on Russia and China, developed world) and how Rio will treat minority shareholders. But while those conversations continue, we hear from sources close to the government that no one really has the first idea what to do with the sovereign wealth fund when it finally starts to get royalties. And finally, when it comes to valuing Turquoise there is plenty of fun to be had. We got some pushback when we passed on a suggested C$30 plus take out value for the 49.5 per cent Rio doesn't already own. We're told that to get to a ballpark near that requires some enthusiasm for future projects at a mine which could have a 50 (70?) year productive life — enthusiasm that a patient corporate buyer might price in a way short term investors have not. (The share price is C$3.69). But then the copper this mine produces will be 80km from the Chinese border with nowhere else to go (for now). We think it is unlikely to be priced according whatever is happening at the LME, so good luck forecasting those particular dynamics. Put a finger in the air and ride your yak to the nearest broker. Ulaanbaatar, March 23 (MONTSAME) Five stock trades were held at Mongolia's Stock Exchange March 17-21, 2014. In overall, 145 thousand and 938 shares were sold of 49 joint-stock companies totaling MNT 168 million 569 thousand and 082.15. "State Department Store" /37 thousand and 441 units/, "Genco tour bureau" /30 thousand and 757 units/, "Olloo" /18 thousand and 472 units/, "Remikon" /17 thousand and 958 units/ and "Ereentsav" /12 thousand and 963 units/ were the most actively traded in terms of trading volume, in terms of trading value--"Ereentsav" (MNT 41 million 481 thousand and 600), "UB hotel" (MNT 24 million and 380 thousand), "UB-BUK" /MNT 23 million and 147 thousand/, "State Department Store" /MNT 21 million 775 thousand and 220.00/ and "Gobi" (MNT seven million 182 thousand and 035). March 24 (BDSec) MSE stocks started the week in red on low trading volume. MSE Top 20 index finished the day at 16,472.87 points, 0.41% lower than the last trading session. Mongolia Development Resources (MDR) lost as much as 11.24% to close at MNT 700.32, followed by Baganuur (-3.57%) and Remicon (-2.60%). On the other side, Hermes (HRM) led the gainers with 4.97% increase. Mongol Savkhi (UYN) and Material Impex (MIE) closed up 3.56% and 2.55%, respectively. Trading turnover dropped to MNT 10.5 million on Monday. Ulaanbaatar, March 25 (MONTSAME) At the Stock Exchange trades held Tuesday, a total of 41 thousand and 519 shares of 26 JSCs were traded costing MNT 37 million 249 thousand and 289.34. "Hai Bi Oil" /22 thousand and 644 units/, "Remikon" /8,197 units/, "Khokh gan" /4,144 units/, "Khovsgol" /2,496 units/ and "Gobi" /936 units/ were the most actively traded in terms of trading volume, in terms of trading value--"Gutal" (MNT eight million 468 thousand and 550), "Hai Bi Oil" (MNT seven million 925 thousand and 400), "Gobi" (MNT six million 020 thousand and 385), "Tavantolgoi" (MNT three million 968 thousand and 078) and "UB-BUK" (MNT two million 782 thousand and 500). The total market capitalization was set at MNT one trillion 645 billion 612 million 113 thousand and 526. The Index of Top-20 JSCs was 16,446.70, decreasing by MNT 26.17 or 0.16% against the previous day. On the Foreign Exchange Auction held on March 25th, 2014 the BOM has received from local commercial banks bid offer of CNY and 38.7 million USD. 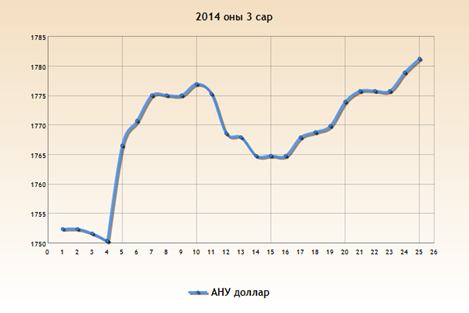 The BOM has sold 8.0 million USD as closing rate of MNT 1781.10. On March 25th, 2014, The BOM has received MNT Swap agreement offer in equivalent to 53.0 million USD from local commercial banks and accepted the offer. Mogi: New injection of state cash in banks? Ulaanbaatar, March 23 (MONTSAME) The cabinet meeting on Friday obliged N.Batbayar, the Minister of Economic Development, and Ch.Ulaan, the Minister of Finance, to redraft the rules of the Customs Tariff Council (CTC) and to take a measure of approving it. The decision aims to ensure a sustainable condition of carrying out the CTC's actions. The CTC's composition was approved again in 2012, but the officials have not been selected yet to serve as the CTC secretary. Due to this, the CTC is not working properly. As the customs tariffs are one of the methods of the external trade policy, the cabinet considered as necessity to order the Ministry of Economic Development to take duties of the CTC secretary. March 23 (East Asia Forum) In recent years Mongolia has become one of the most rapidly expanding economies in the world. According to the Economist Intelligence Unit, it was one of the top performers in 2013, with economic growth of 11.7 per cent, and it is projected to be the second top-performing economy in 2014, only after South Sudan (about 15 per cent). Mongolia is a sparsely populated country with a total population of 2.9 million. Because of the economy's rapid expansion over the last few years, the World Bank now classifies Mongolia as a mid-low income country for per capita income, and it is expected to enter mid-high income in the near future according to Mongolia's Ministry of Economic Development. The main driver of this rapid economic expansion has been the mining industry's development. Mongolia is richly endowed with natural resources. With increasing commodities prices in the world market for the past 15 years, the mining sector's share in GDP increased from 14 to 25 per cent. Mongolia's main export commodities are copper, gold and coal, and Mongolia is now one of the major coal exporters to China, briefly overtaking Australia in 2011 and 2012. Moreover, it is expected that during the next five years major mining projects of copper (Oyu Tolgoi project) and coal (Tavan Tolgoi project) will reach their full potential, likely further increasing economic expansion. 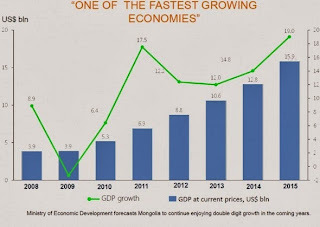 By some estimates, Mongolia's GDP will reach US$25 billion by 2020, which is 2.5 times the size of today's economy. These developments haven't gone unnoticed in the world market. 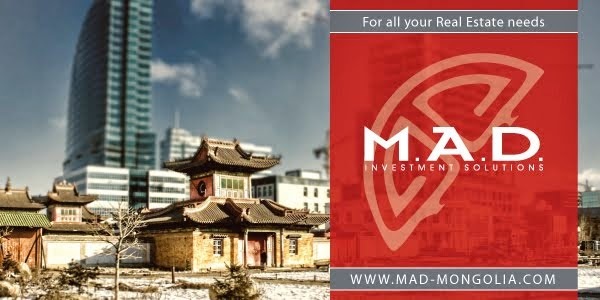 Mongolia has become one of the most attractive economies for investors. In 2013 alone the Mongolian government sold US$1.8 billion of bonds in world markets, which is a testament to the strong upside expectation of the economy. However, the Mongolian economy faces serious challenges to reach its full potential and take advantage of the mining boom's opportunities. Since Mongolia is becoming increasingly dependent on the export of raw minerals, world price fluctuations for commodities have destabilising effects on the nation's economy. Therefore a major policy question is whether Mongolia has enough safeguards in place to protect itself from drastic fluctuations in its terms of trade. Inside Mongolia there is broad agreement about the need to conduct countercyclical macroeconomic policies — especially that the government should be saving during good times to be able to maintain the level of expenditure during economic troughs and stimulate the economy when needed. However, looking at the past 10 years of policymaking, Mongolian governments have found it hard to implement these policies in practice. During and after the 2008–09 world economic crisis the difficulties of implementing and maintaining these policies were on full display. One problem was that, in order to win elections, political parties had great incentives to promote and execute populist policies, such as cash distributions to citizens. To stop these kinds of policies, which greatly hurt macroeconomic stability, major political parties agreed to control this practice and the parliament passed the Fiscal Stability Law in 2010, putting limits on government debt, increases in expenditure and the budget deficit. However, even this law was not enough to discipline the government. Since the country desperately needs to develop and expand its infrastructure to promote economic diversification, the government has found it hard to resist spending more. Its efforts in raising capital by issuing bonds in foreign and domestic markets, and spending it through the newly established Development Bank of Mongolia (DBM), have undermined the spirit of the Fiscal Stability Law. At the end of 2013, budget deficit was at 8 per cent of GDP (including the DBM's loans) and the overall debt level already exceeded the limit of 40 per cent of GDP set out by the law. While the Mongolian government finds itself maintaining increasingly expansionary fiscal policies, the Bank of Mongolia (the central bank) is simultaneously undertaking expansionary monetary policy by extending more credit to government and commercial banks. As a result, in 2013, inflation reached 12 per cent and the exchange rate depreciated more than 20 per cent. It should be noted that the exchange rate's sharp depreciation was also exacerbated by a decrease in the country's terms of trade. In contrast to previous years, the terms of trade depreciated by 15 per cent in 2013. Subsequently, the current account deficit for the year reached US$3 billion, or 28 per cent of GDP, and foreign direct investment decreased by 48 per cent (Mongol Bank – Balance of Payment statistics). This sudden reversal in foreign direct investment also reflects another great challenge for the country. It is evident from the experiences of resource-abundant countries that the quality of institutions is a key ingredient in successfully taking advantage of the opportunities presented by the mining boom. That is, if a country's institutional quality remains weak, the country will not be able to attract foreign investment, which is of paramount importance to reaching full economic potential. Mongolian institutional quality is still lagging behind its stellar economic growth numbers. Institutional qualities can be partly measured by rankings, including: corruption perception, where Mongolia is ranked 83 out of 177 countries (Corruption Perceptions Index 2013); economic freedom, 97 out of 178 (2014 Index of Economic Freedom — The Heritage foundation); doing business, 76 out of 189 (The World Bank 2013); and global competitiveness, 107 out of 148 (The Global Competitiveness Report 2013–2014 — World Economic Forum). Perhaps the most disturbing of all is the corruption index. Government's increasing role in the economy (government expenditure, including the DBM, is estimated to be around 47 per cent of GDP) makes it an attractive breeding ground for rent-seeking by government officials. Although Mongolia is making some progress in tackling corruption at state and regional levels, with some high-profile cases having been through the Mongolian justice system, it could be that these cases are just the tip of the iceberg. Such challenges are not unique to Mongolia, and were experienced by many countries with abundant natural resources. Countries that have been able to put in place good institutional arrangements have overcome these obstacles, and the so-called 'resource curse', whereas countries struggling with corruption, governance and accountability have not. Most importantly, the outcome of these challenges will greatly affect the livelihood of Mongolians. As of 2013, the poverty rate is 28 per cent. Whether the country can translate the mining boom into a better livelihood for all citizens remains to be seen. Tuvshintugs Datdelger is an associate professor at the National University of Mongolia and Director of the Economic Research Institute based at the university. This article appeared in the most recent edition of the East Asia Forum Quarterly, 'On the Edge in Asia'. March 25 (UB Post) Mongolia's biggest event on economic issues, the Mongolia Economic Forum, launched on Monday for the fifth time at the State Palace. The two-day event was opened by Prime Minister N.Altankhuyag, who remarked, "Last year, the forum discussed the creation of unique Mongolian brands, but this year, it will emphasize production in Mongolia with the slogan, 'Let's create in Mongolia'." During his speech, he outlined projects planned by the government to increase production and diversify the economy. He noted that the government has planned to spend one trillion MNT on industrialization programs, to produce building materials, leather and woven clothes, and on the food industry and mining. "Today, the nation is rarely manufacturing final products. 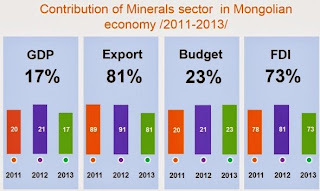 Mongolia imports 88 percent of its commodities, and over 90 percent of exports are raw minerals. Unless we change this, Mongolia will continue to face economic hardship and resource tension will rise," he said. "The Reform Government has declared this year as the year of production, and the government will work to implement consistent policies to eliminate bureaucracy and burdens that get in the way of doing business," N.Altankhuyag added. While last year's forum focused heavily on the mining sector, especially coal, along with the agricultural sector to create brands to represent Mongolia, this year's conference focused on industrialization and production to replace imported products, as well as other aspects of the economy, such as employment, education and training, and green development. The Mongolia Economic Forum is the largest platform for the government, private businesses and experts to discuss and reach solutions to major economic issues, but some participants felt that due to the time constraints of the events, their proposals and criticisms were not heard. "Every year the issue of time constraints is talked about and participants are given limited time to voice their thoughts, which hinders the productivity of the forum. We waste time talking about how little time we have instead of focusing on the statements made by the attendees," said one participant at the event. There were some criticisms of the state and how little progress had been made since last year. A number of business operators in Mongolia voiced their concern that the panelists' explanations for economic hardships such as depreciating currency value were not true. "Business operators don't believe the state's explanation for depreciating exchange rates. We suspect behind-the-scene dealings and corruption. Small and medium enterprises will grow this nation, but while some have received subsidies and state support for decades, other sectors don't receive anything from the state," said an agricultural business operator. At the World Economic Forum, scenarios for Mongolia were outlined and touched on at the Mongolia Economic Forum. In the scenarios, it was highlighted that China's policies and development will have a major impact on Mongolia's economic growth, as it is Mongolia's main trade partner. By 2040, it is expected that China will lead the way regionally in introducing green policies, pioneering new technologies, and cleaner production processes. To introduce greener policies, China will have to accept more modest economic growth as a trade-off for more sustainable development that includes social stability and improved environmental quality. 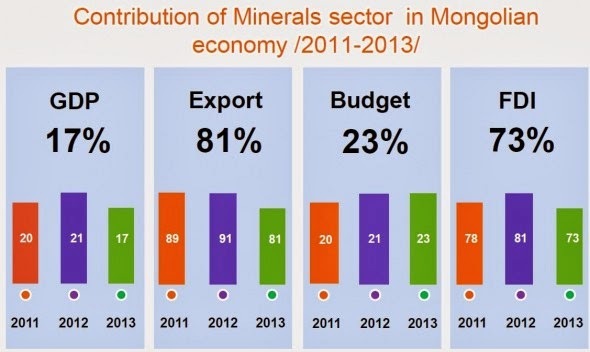 As this transition unfolds, Mongolia will experience a hard time selling its main minerals, as environmental and social costs will rise and demand will fall. "China's electricity prices are beginning to undergo very slow reform. However, it seems that the government is feeling its way in trying to reform what is a sensitive issue. In order to achieve a more sustainable development path, however, this is a crucial area in need of reform. Coal needs to pay its way, and renewables should receive increased support to help them compete in the energy market," said Huw Slater, researcher at Australian National University, with a focus on Chinese climate change policy. "Recently, coal prices have been falling due to oversupply. China's electricity prices are centrally mandated by Beijing, and instead of allowing the prices that are already-subsidized, coal-fired power generators are allowed to sell their electricity to fall proportionately. They have allowed coal power to become relatively more expensive in comparison to the renewable alternatives." Slater also emphasized that although the leaders of China are bent on sustainable development, the vested interests in state-owned energy companies continue to have a huge influence behind the scenes. "The central government has begun to try and de-emphasize the importance of local GDP growth as the traditional marker of local government success, and instead identify other objectives, including environmental ones. However many of these new priorities are not easily quantified or realizable in the short period of time which local leaders hold their posts before moving on. This means that GDP remains a high priority in most areas, with serious consequences for air, water and soil pollution." He added, "The current central leadership, and Premier Li Keqiang in particular, have placed a high priority on sustainable development. The test of their success, however, will be how effective they are at breaking down the influence of vested interests which benefit from the existing carbon-intensive and polluting development path." March 25 (infomongolia.com) On March 24, 2014, Speaker of the State Great Khural (Parliament) Z.Enkhbold issued a Decree No.48 amending the Parliament Plenary Sessions' timetable. The Decree cites, based on the Law on Parliament of Mongolia, Article 11, Paragraph 11.2 and Law on the Rules of Procedures of the Parliament's Session, Article 4, Paragraph 4.1, the morning 2014 Spring Plenary Sessions will be starting on every Thursdays and Fridays at 09:00 am and afternoon meetings to start at 02:00pm. Accordingly, Chairmen and Members of Standing Committees and Secretary General of the Parliament Secretariat B.Boldbaatar are obliged to arrange their works under new hours. The Autumn Plenary Session morning meetings used to start at 10:00 am and continued at 03:00 pm every Thursdays and Fridays. According to the Parliament Law, the first day of the Spring Plenary Session with opening ceremony is set on April 05 annually, but this year the day falls on Saturday, therefore the Secretariat has not announced yet when to start the Session. March 24 (infomongolia.com) A two-day Mongolia Economic Forum has been commenced today in the Government House on March 24, 2014 that aims to provide a permanent venue for open discussion of policy issues and helping policy makers find consensus on development matters. This is a fifth event organized under the auspices of the Prime Minister and supported by Presidential Office and State Great Khural (Parliament) to discuss economic development, its vital problems and ways to resolve, where the World Economic Forum's project team has presented 'The Scenarios for Mongolia' today morning. The opening remarks was delivered by Prime Minister and in his speech Premier N.Altankhuyag noted, "The last year's Forum was themed under 'Mongol Brand' to determine and discuss what we can do or create, so this year we will focus on what we can do under 'Let's Create in Mongolia'. In fact, the end-products manufactured by Mongolians are few to count, where Mongolia imports 88% of its total consumer products, while the total export estimates for raw materials and counts for over 90%. We should fix this system immediately, otherwise to expect economic dilemma easily and the Government is to adhere consistent policy to support creative entrepreneurs by eliminating bureaucracy and barriers. In 2014, the Government of Mongolia is to spend one trillion MNT (Tugrug) for industrialization and under the program to implement several projects to build plants in construction materials, woven cloths, food industry and mining. In 2013, over 20 thousand families were provided with housing and this year, it estimates to accomplish 30,000 housing program, also 1,000-apartment program will be commenced in each Aimag starting from this year. Under the 'Street' Project, 'New Railway' and Khushigt Valley (new international airport) projects will be continued. Expansion works for Amgalan thermal power plant, Ulaanbaatar Power Plant No.III and No.IV will be completed. The 450 MW Power Plant Tavan Tolgoi Project will be started, moreover thermal stations, diagnostic centers and 'Sample Sum' (Sum - administrative unit to an Aimag) projects in each Aimag will be started this year. Therefore, we should intergrate our power to successfully accomplish these projects and I am confident Mongolia to become a creator nation". Ulaanbaatar, March 25 (MONTSAME) A head of the Presidential Office P.Tsagaan made the opening remarks at the 2014 Mongolia Economic Forum which kicked off Monday in the State House. Mr Tsagaan said under the leadership of President Elbegdorj and thanks to fruitful efforts of many Mongolians and the World Economic Forum's staff, Mongolia and the WEF have built an effective and meaningful cooperation in the past two years. "Our cooperation in water issues, in combating corruption and promoting transparency under PACI, and encouraging responsible mineral development have borne concrete results and outcomes," he said. "WEF's contributions and participation in elaborating the Mongolia Development Scenarios were truly instrumental. Discussions of these scenarios in Ulaanbaatar in September 2013 and in a private session in Davos at WEF past January have helped us narrow down our policy focus on many important developmental tasks," Mr Tsagaan said. He emphasized Mongolia-WEF partnership has indeed been fruitful, and Mongolia does value this cooperation and friendship, adding that Mongolia has worked hard to improve business and investment environment, and our cooperation with the WEF has given a strong impetus to our efforts to promote foreign investment. "I am tempted to recall and share with you one story happened at the Mongolia Night Event in January in Davos during WEF. Well, please forgive me for leaking out this pleasant for Mongolia act of violation of protocol, Professor Schwab called the audience comprised of mostly investment community, for actively investing in Mongolia. He did admit that usually he abstains from making promotional speeches, yet, because Mongolia was an exception, because Mongolia is a country of great promise and potential, Professor Schwab urged the investors to come to Mongolia. I do reiterate this call and invitation," he said. "On the other hand, we in Mongolia have a lot of work to do. We must continue firmly harnessing our investment environment and adopting business-friendly policies and practices. We must complete and accomplish the goals and tasks we aspire under the Smart government initiative. You are well aware, in the past 24 years, Mongolia conducted a double transition. Now, from today on, we must pursue and attain a double digit growth. We have the potential, and we have the will. When there is a will, there is a way," he went on. "We have a dream, a big dream to leap into a higher level of social and economic development in years to come. It is not just a dream; it is an achievable aspiration provided we pursue a smart, sustainable, liberal, inclusive economic policy which would promote both domestic business and foreign direct Investment. With this, ladies and gentlemen, I cordially invite our colleague, our friend Kristel to moderate the session. Kristel and her colleagues at the Strategic Foresight Group have been our close partners in the past few years," he said. March 24 (news.mn) President Ts.Elbegdorj left for Japan on Monday, March 24th. The President is expected to undergo back surgery in Japan. President Ts.Elbegdorj previously commented that "Our bad habits such as sitting in the wrong way, standing, carrying water from young age or lifting heavy objects are likely to cause bad back pain. Soon I am scheduled to have back surgery in Japan." President Ts.Elbegdorj had back surgery twice prior to this instance in Mongolia. March 26 (UB Post) The Mongolia Economic Forum was held from March 24 to 25. The following is an interview with former Prime Minister and member of the Mongolian People's Party S.Batbold about the forum and Mongolia's economic development. -Why was the Mongolia Economic Forum established? -There's no place where development policies are discussed and agreed on with the public. Discussing development policies with a small number of people including MPs, governors and heads is deficient. It's also wrong to do populism and make policies out of most discussed or voiced subjects. We need to approach the matter in a more reasonable, researched and scientific manner with participation from scientists, researchers, entrepreneurs and economists. We need to set a standard that will include ideas from international institutions that work with Mongolia, including international banks, financial institutions, representatives of investors and the public in governmental policies. To determine development plans for next year or the medium-term, and further for the long-term, we established the Mongolia Economic Forum. It was decided that we would emulate the Davos World Economic Forum. -Were you able to set the standards to listen to the necessary people when determining governmental policies? -I believe that the first meetings were beneficial to the society. It became an orientation for us. We opened our ears and received pluralistic opinions. There were more improvement and new aspects in the last two year's forums. For instance, a discussion about Mongolia was held in Davos and that scenario is to be introduced in the upcoming forum. The drawbacks are that from the observations from the last two year's economic forum, it was directed towards one side – the authority. There's a deficiency in promoting it to the public, to make it more open and give access to counter forces and innovators. -Do you think that the state really listens to the people before? -It's insufficient to listen to opinions of the people once in a meeting and cast them away. During our time, we submitted ideas to include participation from civil society when determining policies and developing legal frameworks for them. According to this, the government issued a document for civil society to adhere to the policy. Meetings and discussions were organized for this. Economic development and other big issues should be decided based on substantial research, analysis and calculations, not just on populism. As a result of the prolonged attempts to introduce this principle, if the economy had a minus indication in 2009, starting from 2010, it was slowly rising and in 2011, it reached up to 17 to 18 percent increase. It intensified in 2012. However, it indicated only 13 percent last year. Measures and decisions made during the previous government were seen as the foundation of stable long-term growth of economics. The World Bank, International Monetary Fund, World Economic Forum and institutions that conduct research for competitiveness made evaluations that Mongolian economy is stable for long-terms and will increase by 15 percent on average. Evaluations show that the economy can grow rapidly for the next 20 years. -What is the current economic growth rate? -The growth rate is currently slowing down. The economic growth of 17 to 18 percent became 11 percent now. This indicated that growth rate has fallen. There is growth to a certain degree. The speed slowed down, not growth. Substantial risks and challenges for further prolonging of growth can be observed. -To increase sustainable growth rate, what kind of solutions do you hope to accomplish from this year's economic forum? -I hope it starts from ordinary things. Decisions of the government should be more close to the reality and more focused on giving feedbacks and results. The government should utilize its lever mechanisms including taxes, loans, quota and permit system to give correct, fair and open support to sectors that are trying to create employment. If not, business entities are decreasing their employment. Companies no longer employ new staff and are decreasing the amount of staff and salary. The previous government intensified vocational training centers and employed a lot of workforces from the centers to business entities. Now, there is no other choice but to decrease expenses through dismissing employees and reducing the number of local governments. This is a very realistic example of financing of business entities of today. The current conditions seem to be rather difficult. I do understand. During this difficult time, with dropped MNT exchange rate, in order to help and show a little bit of support to the people, we must increase salaries and pensions. It's nice to say big numbers of economic growth rate at macro levels. What's most important is to calculate how that big sum is going to affect families and how it impacts their lives. It should stick to the people. Governmental support should be practical and economic growth should be allocated fairly to the society. With this principle, we increased salaries and pensions by 2.5 times for the last four years. However, pensions haven't increased to levels we've discussed, neither has anything been implemented for salaries. -Do you agree that there are substantial external reasons for the tough economy? -I do, there are external substantial forces at large. In the world market, the price of mining products has relatively decreased. There are corresponding growths and declines. Now it's reviving and the right approaches are being observed. American and European economics have started to revive. This isn't difficulty only seen during this government. There were economic crisis in 2008 and 2009. It wasn't easy at the time. Now, there aren't external difficulties or challenges worse than those times. -During the "united government," apart from Oyu Tolgoi, Mongolia was supposed to repay 350 million USD worth of loans in the form of coal to China's steel giant CHALCO by the end of 2013. It seems that it still hasn't been completely repaid? -It was a contract that was to finish within 2013. It was possible. This contract wasn't made by the government. It was made within legal frameworks and world market price and formula boundaries by state industrial enterprises. As for the government, they only provided for human development funding sources with the revenue from mines in accordance to decisions made by the parliament. We didn't say that it was an excellent contract. We can't deny that there were areas that could've been improved. However, after election, talks about politics and economics were circulating. The deadlines were prolonged and a lot of time was taken. -This government is actually said to have significantly more funds than the previous cabinets. When it has funds, why is the economy troublesome and workplaces decreasing, and why can't they find financial sources for supplementary pension and salary? -They say that the previous government left debts. In spring 2012, we launched bonds and handed over 580 million USD to the current government. The current government created Chinggis and Samurai bonds and the Central Bank of Mongolia gave three trillion MNT to the Price Stabilization Project. The government gave securities of one trillion MNT to domestic market. Apart from that, they made swap contracts with neighboring countries. From this, there are plenty of funds and financial sources. Spending money from bonds outside of the State Budget isn't correct legally. Three trillion MNT given by the Central Bank to stabilize prices should also be recorded within the State Budget. The World Bank and International Monetary Fund have noted this and are warning to make adjustments. This must be rectified. Instead of criticism for spending of these financial sources more transparently, many are criticizing the fact that it is used on projects to support their policies and companies. Direct investment to the country has declined. From this, you can see the lack of policies for investments. Mongolia only thinks of external sources when they hear of investments. There are domestic investors too. Construction, agriculture, small and medium enterprises and all sectors needs support from investors. We need to hasten road construction, railway, energy and industrial projects and increase involvement of the private sector. We need to show investors that governmental policies are more comprehendible, stable, competitively, reliable, long-term and that they can trust the government. We can give this trust through fair activities and just policies. Wrong decisions and mistakes of the government will lose their trust. We need to always concentrate on this. -The main role of opposing parties is to correct and fix mistakes of authorities through criticism. Why isn't your party fulfilling its obligation? -I do admit that our party isn't adequately fulfilling its obligations as an opposition. There are factors in the legal framework that don't allow us to fully conduct opposing works. MPs from our party haven't had a union for around a year. Additionally, even now, we're unable to fairly and righteously enter the Standing Committee. A third of the MPs are members of our party. Yet, when we go to the Standing Committee, we only take up to a fifth or a tenth. Only two members are seated in the Standing Committee with 20 members. The rest aren't in the Standing Committee, and instead they established a Complaint Standing Committee. They tell us that we can voice ourselves in any Standing Committee but we want to exercise our rights to oppose decisions. We are in a situation where we are limited by the legal environment. Still we are expressing our position as the opposition. There are criticisms that it's insufficient and weak. We do have places where we lack knowledge and can't do populism effectively. We are limited even in media environments. We think that it's more beneficial if we voice ourselves based on substantial and researched facts in order to keep policies fair and correct. Part 1a of 250 pages. March 25 (Cihan New Agency, Turkey) The Sözcü daily reported on Tuesday that Ciner Media Group Deputy Chairman Fatih Saraç -- whose voice purportedly appears in a recently leaked audio recording of a conversation with Prime Minister Recep Tayyip Erdoğan's son Bilal concerning a TL 1 million donation to the Foundation of Youth and Education in Turkey (TÜRGEV), of which Bilal is an executive board member -- met with Kibar Holding Chairman Ali Kibar. Kibar subsequently told the Hürriyet daily on Tuesday that Saraç had given him a project report for the construction of a railway in Mongolia, and that their meeting didn't have anything to do with the recently leaked audio recording. The conversation between the two lasted about 15 minutes, reported Sözcü, which published pictures of the meeting. According to the report, Saraç spoke for the most part and Kibar listened without interrupting much. The daily added that later, while attending a dinner with South Korean guests at an İstanbul hotel, Kibar briefly stepped out to meet Saraç, who went to the hotel to give him a file. According to the report, Kibar "pulled a long face" when he received the file. The recording purportedly has Saraç asking Bilal Erdoğan to relay a bank account number so Kibar could send the money to TÜRGEV. Bilal responds by asking if the money is "zakat" (an Islamic term for giving alms relative to a person's accumulated wealth), or something different. Saraç replies that money is not being given as zakat. Kibar harshly reacted to the leaked tape and denied implications in some media outlets that this amount was wired to TÜRGEV with the expectation of privileges in public tenders. He said the money was a part of the company's social responsibility practices that have been in place since its foundation. Kibar later told Hürriyet that he started laughing out of anger after the assertions surfaced. He said he was having a farewell dinner for a high-level official from the South Korean Embassy. Kibar said Saraç called him that day and asked if he had time for a brief meeting. "We had a conversation in the middle of the hotel lobby for only five or six minutes," he stated, adding: "One of his friends has this project in Mongolia and had its feasibility studies completed. He wanted me to take part in it. I have no interest [in the project] but surely, I wouldn't turn down his meeting request. I have known Saraç since long before these incidents. We have been acquaintances for about 20 years now." March 26 (UB Post) Mongolian designer Ariunaa Suri presented her collections at the Mercedes Benz Fashion Week in Tokyo, on March 22. This was her second time taking part in the event that defines future trends of the fashion world. This time, her show mainly focused on men's wear made of pure linen materials. Mongolian models Ch.Subedei, Ts.Michihdmaa, S.Tugs, Yu.Baljidmaa and I.Tugsuu wore her designs to songs of The Lemons rock band of Mongolia from their new album. The Mercedes Benz Fashion Week is held twice a year in the world's fashion capitals, during which, the trends for the next season are born from the latest collections that are unveiled. The Mercedes Benz Fashion Week Tokyo is hosted by the Japan Fashion Week Organization and held on March and October. Founder and Chief Designer of the brand, Ariunaa Suri is a Mongolian designer whose passion is creating fashion for individuals and unique people. The brand was established in 2011. Ariuna has worked as a creative designer in Berlin after her 10 year study and research on clothing in Bremen, Germany. For her designs and collections, she urges assimilation of the Mongolian nomadic ethic with Western style and reflecting it in the mixed soft hues by organic fabrics such as wool, cashmere and leather of live stocks from the steppe of wild weather. Ariuna Suri's brand principle is "Mystery of In-Between." According to her philosophy, we are a dweller between the West and the East where the culture, lifestyle and history of art are divergent. The inspiration of the outfits is rooted in Mongolian traditional extraordinary costume's unique pattern, elements and motivation. Also the punk urban looks of her FW14/15 Collection is mixed with slight themes, Nomadic Ethic and Western styles by neutral and the intermediate colors in the natural fabrics. The sense of freedom in the collection is inspired by wild nature of Mongolian endless steppes and exotic tradition of non-sedentary nomads. March 25 (UB Post) Mongolia is planning to sow grain on 315,000 hectares of land, wheat on 304,000 hectares of land, and potato on 15,400 hectares of land this spring. Regarding the spring sowing, the parliament of Mongolia decided to exempt 20,000 tons of crop seed from customs tax and value added tax (VAT). Seeds will be imported from Altay Prefecture in China and Buryatia in Russia. The state is allocating quotas for the seed importing businesses. The Fund on Supporting Crop Farming has therefore planned to import 8,800 tons of seeds this spring. Spring sowing will start in late April and will end by May 10, according to the preliminary plans of the Ministry of Industry and Agriculture. March 26 (UB Post) On March 17, Ulaanbaatar governor and City Mayor E.Bat-Uul, gave the public and the press information about construction work which will be implemented this year. We spoke with him for more details about this work. -When will the implementation of the Smart Ulaanbaatar project start? How much money will be spent in total? To explain this project in a few words, we are giving citizens and entities the option to manage their work from their home or office. Therefore, companies do not need to lose time when participating in tenders. In other words, city services will be transferred to an online system. The Smart Ulaanbaatar project will be implemented through 2020. Maybe, there is a misunderstanding among the public that it will start tomorrow. This project will be implemented in three phases. In total, 14.3 billion MNT will be needed. -The city's new administration building will be built in a suburb. How much money will be spent on this building? How will you decide on the location of current city administration buildings? There are 548 state services available to citizens. Primarily, 56 services will be online. In order to set up the online system, we are focusing on solving infrastructure issues. Thus, the state services will be received at the khoroo level. For the new centers, the cost is not clear now. Halla Group of the Republic of Korea will build the center from its own capital. But after it is built, the city administration has to pay back the debt through their financing in three years. From the Korean side, the general assessment of financing has already been received, but not yet finalized. In connection, nine city administration buildings will be released and privatized. Our president issued a decree and ordered the organization of the privatization work for Khangarid Palace primarily. Organizing work will be held for the agencies of government going into the palace. -People are saying that the city's pure water safety is threatened. How is the city administration taking this issue into account? Permission for building construction has already been given to the building companies and their wells are out of the pure water protection zone. As the Water Regulation Authority said, they take the pure water resources from a depth of 170 meters and there is no threat of the water becoming contaminated. There is no need to build construction on our pure water reservoir. Thereby, the order was issued. Unfortunately, the order failed at the Administrative Affairs Tribunal. -The construction companies have not been meeting standards for building work. Recently, one person died due to the irresponsibility of Max Group. What kind of measures are going to be taken against these companies by the city administration? Last July, the city administration issued the Occupational Safety Ordinance. According to this ordinance, guilty parties will take responsibility. Moreover, companies have to submit their budgets, but they do not do this. As a result, damage and accidents occur. Even if we say there must not be any technical failures, they use the back door. For example, in Orkhon Town, they installed waste pipes without getting official permission. If they won't inlet the pipe by paying five million MNT, the environment will be destroyed and the waste could cause infectious disease. Many people think that if they have money they can do anything they want. Cooperating with Mobicom Corporation, we have created a new application that can be used for checking a company's building license. To use it, consumers have to direct their phone's camera at the building site and their phone will tell them whether the company has a license, technical and heat permission, who it belongs to and other information. -What measures will be taken for buildings that are not ready to use, waste time and need to be torn down? Is there any possibility of registering all the buildings in the capital's boundaries? First of all, when we demand that companies tear down and they do not accept this demand, we take the buildings as our property and tear them down. All those projects are monitored. About the buildings that are more than 17 floors, the Ministry of Construction and Urban Development will take considerations. -The Commons of Songino Khairkhan District suggested that the district be divided into two parts. Will the city administration support this? The Great Khural will solve Songino Khairkhan District's issue. The Great Khural solves issues such as the division of the districts and delimitation. The issue to divide Songino Khairkhan District has not been delivered to the city administration officially. -Distributing plastic garbage bags causes another debate. Citizens want to see the city build new kindergartens and schools instead of distributing plastic bags. How will you solve this issue? Distributing plastic bags will be continued in the future. If people throw their waste in the streets, there are not any measures to handle this problem. -Has the waste bag budget increased to 4.5 billion MNT3? Why has it increased? The budget has increased. The number of households to receive plastic bags increased and it led to an increase of expenses. From October 2013 to the first quarter of 2014, for the production of 33.3 million plastic bags and their distribution to 317,131 households, 3.1 billion MNT was spent. But this year, 335 thousand households will receive the plastic bags, and 4.5 billion MNT will be spent to distribute bags from April 2013 to the end of the year. An icon of a nomadic age now serves as urban housing in Ulan Bator's underprivileged districts. March 24 (The Diplomat) Daynsaikhan's ger sits at the very edge of Ulan Bator. Completely surrounded by snow, it appears cold and isolated, just a few meters from an illegal trash site. Inside, however, it is warm and cozy. The afternoon sun sneaks in through the roof window, lighting the basic, neat furniture: a few wardrobes, a television set, some shelves, a table, family pictures. The smell of the wood burning in the central stove fills the air, sealing off Mongolia's winter – the outside temperature is minus 30 degrees Celsius. No outside noise seems to penetrate the wool felt that envelops it all. Three kids sit puzzled on the only family bed while their mother speaks. They don't often receive visitors in this part of the city. "We moved from the countryside two years ago looking for a better life in the city and we settled down on this plot," Daynsaikhan says in a low voice while feeding her youngest daughter. None of her kids has ever been to school and she looks after them around the clock. Her eldest, a 10-year-old boy helps out with the daily errands typical of the ger lifestyle: filling a few water tanks at the kiosk down the road, fetching wood and coal for the stove, washing up the siblings in a tub inside the ger. A pit latrine serves other hygienic needs. They all live on the 500,000 tugriks (US$284) per month Daynsaikhan's husband makes working in the construction sector seven months per year, when temperatures are mild enough to allow construction to proceed. Gers have been an iconic part of Mongolian nomadic culture for centuries. These white, mobile tents have been home to generations of Mongolian warriors and herders, through the ebb and flow of the nation's fortunes since the time of Genghis Khan. Perfectly suited to a nomadic lifestyle, gers were never meant to serve as housing for urban residents. Yet today they have become the symbol of Ulan Bator's growing slums, the ger districts. Seeking better living conditions, around 746,766 people have settled live in gers or other semi-permanent structures over the last 15 years, according to figures from a community mapping project developed by the city municipality, Asia Foundation and Australian Aid. That is more than Ulan Bator's total population in 2000 and represents more than 57 percent of today's 1.3 million citizens. In relative terms, Ulan Bator's ger districts are as sizeable as the infamous slums of Asian megacities such as Mumbai and Dhaka. Their dwellers all share Daynsaikhan's problems: They have little access, if any, to basic public services such as piped water, sewage, central heating – let alone schools, hospitals and public transport – and they are forced to make a living in very harsh conditions, with temperatures falling to minus 40 degrees Celsius during winter. High unemployment and rampant alcoholism make things worse. Most of them have shared little of Mongolia's recent economic boom. The country's per capita income has indeed spiked, increasing five-fold to more than $3,000 over the past decade, but inequality is also on the rise, as highlighted by the latest IMF country report. "Here we feel so far away from the city, everything is so different. The climate is windy, dusty, we even wear different clothes," Gaanbat, the managing director of khooro (subdistrict) 13 local government says. Seen as a temporary by-product of the country's economic growth, Ulan Bator's slums struggled for years to make the local or national political agenda. "The ger area was not officially considered to be part of UB, authorities hadn't thought that it would expand that much," Ariunaa Norovsambuu, Asia Foundation's project coordinator for the community mapping project, says. When they realized the real nature of the issue, authorities could no longer bury their heads in the sand. "Given the current size of the ger districts and the fact that we expect them to add another 400,000 people in the next ten years, we decided that their redevelopment is the best solution to improve the city living conditions," the municipality's head of project and cooperation department Otgonbaatar D. said. The ger areas are being mapped and integrated in the city budgeting works for the first time. A new city masterplan approved by parliament in February 2013 sets a first ever framework for the ger districts upgrade, bundling them up in six sub-centers to be equipped with the necessary infrastructure to give residents access to basic services. The sub-center approach represents a radical change in mindset from past programs. When the black smokes coming out of the gers' stoves started contaminating the whole city, turning it into one of the world's most polluted (each family burns between 30 kg to 50 kg of coal and wood daily during winter), the government scrambled to approve relocation schemes based on construction developments and cheap mortgages. Yet these programs largely fell short as most ger residents simply could not afford them. In addition, the initiatives failed to recognize the value of local social and economic networks. "When you upgrade poor urban areas, the best approach is to redevelop on site engaging with local communities, because their network is there, as opposed to force people to move far away," Asian Development Bank (ADB)'s urban development specialist Arnaud Heckmann observes. Joining efforts with the ADB, the municipality has drafted a $320 million program that sets the agenda to bring basic infrastructure to the six sub-centers identified by the masterplan. They will have paved roads, water and sewage networks, local heating plants, as well as schools and business incubators. At the same time, the program will lay the groundwork for more efficient service providers and support capacity building processes. The program's success will depend on its ability to trigger densification, which will eventually make it economically feasible. As each Mongolian is legally entitled to own up to 700 square meters of land, the ger districts are divided into dozens of formally or informally recognized land plots, known as hashaa, where families live. Private developers are already negotiating deals with residents asking them to swap their land plots for newly built apartments in the area. However, the process is likely to prove difficult. Residents have spent their entire lives in gers and hashaas, even before they moved to the city. 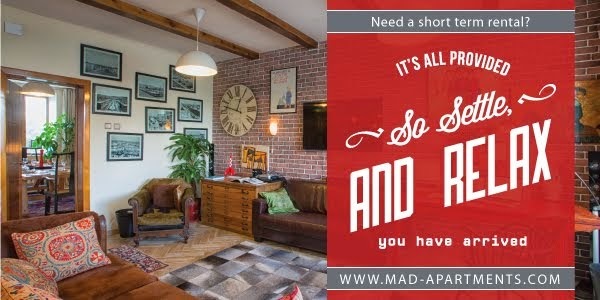 The idea of living in walled, permanent apartments still raises eyebrows. Besides, after being ignored for years, their trust in authorities is extremely low. That's why entire blocks belonging to the Bayankshoshuu and Selbe sub-centers, the first two to be upgraded, still appear reluctant to agree to any sort of land swap agreement, according to figures by UN-Habitat. "There is a timing issue here. They need to have the infrastructure in place to realize that this is really coming. There is a little bit of momentum that has to be respected," ADB's Heckman says. There is another hurdle to be cleared. A ceiling on public debt leaves little room for approval of the ADB financing package, which amounts to $163.7 million, with another $60.3 million coming from co-financiers and the remainder to come out of the local budget. Total public debt is already 58.6 percent of GDP. Congress is slated to discuss the issue in the approaching spring session and the outcome remains unclear. Gers remain one of the most fundamental traditions of Mongolian unique nomadic culture, and still provide home of almost half of Mongolians nationally today. "Mongolia has nomadic culture, thus there should be ger districts," bluntly states a column signed by columnist Dari E, who writes for the English-language newspaper UB Post. Now that Ulan Bator's gers are on the map, there is a chance that they can become the link between an ancient nomadic lifestyle and modern-day living, without necessarily standing for poverty and deprivation. Jacopo Dettoni writes on business and current affairs. Bolor Munkhbold contributed research. BEIJING, March 24 (The Times of India) China's official media is encouraging public discussion about whether Beijing should occupy territories of neighboring countries in the manner Russia has done with Ukraine. Thousands of netizens have joined the discussion on the issue in micro blogging sites. "China may learn something from the Ukraine situation. However, it cannot copy Russia's practice," Global Times, which is closely connected with the Communist Party, said in a opinion piece. The article suggested "China keeps a sober mind" on the issue but it is capable of advancing into territories of neighbors. Chinese netizens are suggesting China could start by making advances into Mongolia as the first step, and follow it up with similar moves in other places in the neighborhood. "Russia has dealt with Crimea vigorously, but China will have to show patience when dealing with disputes with its neighboring countries," the paper said. China is involved in territorial disputes with India, Japan, Vietnam and Philippines besides being strategically close to Pakistan Occupied Kashmir, which India considers its territory. Some are questioning the former Soviet Union's role in separating Mongolia from China in 1945. "In October 1945, the Soviet Union encouraged northern Mongolia to hold a referendum, and with less than 50,000 voting participants, ripped away 15 percent of China's sovereign territory," a satirist who goes by the online moniker Cui Chenghao wrote to his two million followers in Weibo, China's Twitter. "Return Mongolia to us, and then we'll support the Crimean referendum," another Weibo user said. But the official Chinese media is full of praise for Russia's show of muscle that has even frightened western powers, who are now reluctant to interfere in favor of Ukraine. "The US and EU are reluctant to take decisive counter measures, as they are not sure what Russia's response would be," Global Times said. Suggesting China's future is best assured by enhancing military power, the paper said, "In international politics, the No.1 element is a country's comprehensive power. What is said is not so important - but after gaining more power, there will be fewer hostile challenges". March 25 (infomongolia.com) Upon the invitation of the Minister for Foreign Affairs of Mongolia, Secretary General of Shanghai Cooperation Organization (SCO) Dmitry Fyodorovich Mezentsev is conducting an official visit to Mongolia on March 23-26, 2014. On March 24, Foreign Minister L.Bold received the Secretary General D.F.Mezentsev in his office, where parties focused on issues concerning Mongolia-SCO cooperation and other issues of mutual interests. During the meeting Minister L.Bold noted, as an observer in SCO and in the light of its policy for taking active part in regional political and economic cooperation, Mongolia has actively participated in SCO activities and has an aspiration to maintain productive cooperation with SCO on wider scale. Highlighting an importance of mutually beneficial economic collaboration for ensuring the regional security, he further added that there are great possibilities for such cooperation with SCO member states and observers. Secretary General D.F.Mezentsev introduced comprehensively about the organization's further activities and vision, and confirmed SCO commitment to broaden joint actions with observers including Mongolia. On the same day, Secretary General D.F.Mezentsev and SCO Under Secretary General M.A.Zhalopov held meeting with Chairman of Security and Foreign Policy Standing Committee of the State Great Khural (Parliament) Ts.Oyunbaatar, MP Ts.Tsolmon and MP N.Enkhbold in the Government House. In the scope of 10th year of Mongolia's observer status, sides exchanged views on some measures to organize in 2014. During his visit, Mr. D.Mezentsev will pay a courtesy call on Prime Minister of Mongolia N.Altankhuyag and Minister of Road and Transport A.Gansukh. Today on March 25, SCO Secretary General D.F.Mezentsev will attend at the press conference to be organized at the Institute for Strategic Studies at 03:30 pm. Ulaanbaatar, March 25 (MONTSAME) The Speaker Z.Enkhbold Tuesday received Mr Gerhard Tiedemann, the Ambassador Extraordinary and Plenipotentiary of the Federal Republic of Germany to Mongolia. The Speaker expressed a satisfaction with meeting with Germany's Ambassador to discuss the bilateral relations including the inter-parliamentary cooperation. In turn, Mr Tiedemann introduced to the Speaker some works for a planned official visit of the Speaker to Germany and expressed a willingness of the German side to develop a wide cooperation with Mongolia in economic sphere. Mongolia-Germany economic forum will take place this, he noted and said he is satisfied with the cooperation between professional organizations in air transportation consulting and railways technical reforms. The Ambassador also asked the Speaker to support efforts of his country to widen the economic cooperation in frames of the 40th anniversary of the Mongolia-Germany diplomatic relations which is marked this year. Here the Speaker said Mongolia intends to boost its industrial sector and added Mongolia is learning German experience in producing gas from coal. He also said he is confident that Germany's Ambassador will significantly contribute to expanding of the bilateral mutually-trusted and friendly relations and cooperation. March 20 (EU) EU Commissioner for Development, Andris Piebalgs will today announce over €6.5 billion in new support for countries and organisations in Asia for the period 2014-2020. The announcement will be made during a two-day event to discuss development cooperation with authorities from the countries and regional organisations involved. Commissioner Piebalgs said: "The EU is committed to cooperation with Asia for the long-run. The future programmes are expected to help achieve the Millennium Development Goals (MDGs) in the region, address climate change, promote energy efficiency, facilitate business and trade through better market access and support regional integration". While Asian economies have shown remarkable recent growth, poverty is still widespread on the continent, with about 800 million people in the Asia and Pacific region still living in extreme poverty (live on less than $1.25 a day), according to the Asian Development Bank. As most countries in the region are facing challenges due to uneven regional development and increasing income inequality, EU funding for national and regional programmes in Asia for the time period from 2014 – 2020 increased by 20% compared to the financing period 2007 - 2013 (€5.1 billion). The new funds will address key priorities being discussed with the countries present in the programming seminar in Brussels, as well as with the representatives of the regional organisation the Association of Southeast Asian Nations (ASEAN). Some of these priorities include social protection, better health and education, job creation and better integration of partner countries into regional and world markets. Funding for EU-Asia cooperation comes from the Development Co-operation Instrument (DCI), which is part of the overall EU budget. 12 countries (Afghanistan, Bangladesh, Bhutan, Cambodia, Laos, Myanmar, Mongolia, Nepal, Pakistan, Philippines, Sri Lanka, and Vietnam) in Asia are eligible for bilateral development programmes. Ulaanbaatar, March 24 (MONTSAME) The South African delegation led by Mr Godfrey Oliphant, the Deputy Minister of Mineral Resources, visited "Shivee-Ovoo" Mongolian coal mine on Thursday. The delegation witnessed the mine's operations and capacity and got au fait with its long-term goals. Executive director of the mine O.Otgonbaatar met with the Deputy Minister to exchange views with him on ways of introducing the latest hi tech of S.Africa to our country and of cooperating in this field. The Deputy Minister said that his visit will be a start of a fruitful cooperation. The mine, located 260 kms from the city, is the largest brown coal deposit providing 30 percent of domestic coal demand and 70 percent of coal demand of energy production for central region. TIRANA, March 25 (Xinhua) -- A memorandum of understanding was signed on Tuesday here between Albania and Mongolia to strengthen relations between the two countries, according to Albanian Telegraphic Agency (ATA). Albanian Deputy Foreign Minister Sokol Dervishaj held a meeting with visiting Mongolian Foreign Minister Damba Gankhuyag (Mogi: Deputy FM) on the occasion of the 65th anniversary of the establishment of diplomatic relations between Albania and Mongolia. Dervishaj briefed Gankhuyag on Albania's achievements, Albanian government's priorities and the active role in the region, said ATA. Gankhuyag confirmed his readiness to promote cooperation between the two countries by improving the legal framework of cooperation between Albania and Mongolia, according to ATA. As part of the activities organized to mark the 65th anniversary of the establishment of diplomatic relations between the two countries, Mongolia opened the Honorary Consulate of Mongolia in Tirana on Tuesday. March 25 (UB Post) We do not attach any specific value to water because there is plenty of it today. However, one cannot even spend 24 hours without it. Any person who is dying of thirst in a desert will be willing to give up whatever valuables they have in exchange for a single cup of water. What should be done in order for Mongolians to fully recognize the true value of this precious treasure and start protecting and saving water? Do we need to run out of water and be threatened by dying of thirst to realize its value? In 1992, the United Nations declared March 22 as World Water Day and called on every nation to spend this day analyzing and improving their consumption of water, as well as their attitude towards water usage. Water scarcity is causing 14,000 deaths a day (11,000 of which are children below the age of five) worldwide. It is projected that a total of two billion people will be suffering from water scarcity by the year of 2050. What is and will be the cause for such a scenario to come true? On one hand, 98 percent of the total water resources on Earth is saline water, one percent is locked up in polar ice caps, and another one percent (which is available for human consumption) is in rivers, lakes, and underground. On the other hand, as the world's population keeps increasing, water consumption is going up at even faster pace. To make matters worse, 95 percent of all the cities in the world are disposing wastewater into sources of fresh water such as rivers. Mongolia is not an exception. Although no one has died of thirst so far, it is safe to say that the train has already left the station. Ulaanbaatar, which has become the home of more than half of our total population, is looking at its sole source of fresh water being significantly compromised. Our groundwater levels have dropped 15 meters while international organizations are ringing alarm bells that our capital city will start suffering from a water shortage in 2017. Their warning is supported by the increasing consumption of water, lower efficiency, and reduced water reserves. Also, the infrastructure that delivers water to residents of the city has become greatly damaged, and there is a high probability of simultaneous pipe failures. Mongolians do not pay for water itself, but for the services it is provided by, such as its purification and transportation. It costs 0.55 MNT per liter for the industrial use of water whereas you pay only 0.32 MNT if you live in an apartment. Also, it costs 7,950 MNT for a fully loaded five-ton truck to transport water to ger districts. Water distribution points in ger districts charge one tugrug per liter, which means a total of 5,000 MNT is collected when they finish distributing five tons of water. Therefore, operators run a deficit of 2,950 MNT every time such distribution takes place. The Water Supply and Sewerage Authority, which collects, purifies, stores, distributes and protects drinking water, ran a deficit of 10 billion MNT in 2013, and is projected to have a deficit of 16 billion MNT this year, taking the expected performance into account. Thus, they can barely keep operating, let alone improve the city's water infrastructure. As the existing infrastructure is already 50 to 60 years old, one should not be surprised if their tap water has turned yellow because of rust. On the contrary, it is fortunate that those old pipes are still functioning despite the excessive amount of rust that has made them narrower. DO WE CONTINUE USING WATER SAME WAY WE DO TODAY? Mongolians who live in an apartment use 276 liters of water a day on average, which is quite a luxury. It is two to three times more than the water use of an average household in a developed country. On the contrary, people living in ger districts carry their water from a well to their home themselves, and one person has an average daily water use of 8-10 liters, which is very small. Factories and plants use water for industrial purposes mostly, but they currently do not sort out and clean the water that is too polluted, or treat the water used to wash and process animal skins and wool. Due to malfunctioning equipment, some companies send toxic water to the central wastewater treatment system and interrupt its normal performance. The central wastewater treatment facility is too overloaded and is pumping domestic and industrial wastewater into the Tuul River without proper treatment. People who live in the Yarmag and Songino areas are falling victim to the pollution. They do not know what to do except complain about thick smog in winter and an unpleasant smell in the summer. The water that isn't properly treated changes the color and smell of the Tuul River, which flows a distance of about 100 kilometers. As a result, our beloved Tuul has become one of the five most polluted rivers in the world. Every time senior officials from the government, as well as the city management, visit the river, they react with fake surprise and promise to resolve the issue before escaping in their huge jeeps. Many government administrations have been aware of the problem, but none of them have ever acted upon it. It appears that they not only are incapable of solving such a problem but also have their hands tied by corruption. LET US CHANGE OUR ATTITUDE! 1. As there are no other choices, we should accept an increase in the price of water used domestically and industrially. This way, the Water Supply and Sewerage Authority can operate efficiently, which will allow them to improve the city's water infrastructure step by step. Also, we need to have citizen representatives present at their Board of Directors meetings for the purpose of public scrutiny. 2. We should raise awareness so that people will realize the value of water, change their attitude, start using water in a sustainable way and adopt a culture to save water. 3. Other measures we should take include: using our fresh water for human consumption only, treating water for other uses, making the best out of water from rainfall and snow, developing comprehensive plans for each of the city's districts, and demanding that the factories that process animal skins treat the water resources they pollute. If such factories are moved to more rural areas, it should be required that they pump the water they use back into the central system. 4. In accordance with the 2013 decision to increase the tax on groundwater used for mining and industrial purposes, half of the revenue from such tax now goes to local government. But we have to make sure that the local governments use that money to increase drinking water reserves. For example, half of Umnugobi aimag's 13 billion MNT, Zavkhan's 10 billion, and Ulaanbaatar's three billion should be spent to fulfill that purpose. 5. Reservoirs should be built wherever possible in the country to catch and contain 20 percent of the water from flowing rivers. We need to build a dam that spans the Tuul River east of Ulaanbaatar and accumulate fresh water. Also, a modern beach and resort should be newly established. My fellow Mongolians, it is time for us to love our water, which is the very foundation of our happy and healthy life. In recognition of World Water Day, we must treat our water dearly! CHEYENNE, Wyo., March 26 (AP) — A Colorado man must serve two years of supervised probation on a federal felony conviction of conspiring to smuggle fossils from China into the United States, a federal judge ordered Tuesday. Judge Scott Skavdahl also sentenced Rick Rolater, 69, of Eagle, Colo., to pay a $25,000 fine. Rolater had sold fossils through two By Nature Gallery stores, one in Jackson, Wyo., and one in Avon, Colo. Under his plea agreement, he agreed to forfeit several fossils to the government, including a Tyrannosaurus skull authorities have said likely will be returned to Mongolia. Rolater apologized to Skavdahl, saying he deeply regretted that he didn't apply his training as a certified public accountant to scrutinizing his dealings with sources exporting fossils to him from China. Lawyers said some shipments Rolater received were intentionally mislabeled to avoid scrutiny from government officials. Although Skavdahl accepted the plea agreement, he said he questioned whether the punishment was enough to get Rolater's attention. "He knew better, but he liked the money," Skavdahl said. Federal prosecutor Stu Healy and defense lawyer Pat Crank of Cheyenne both spoke in favor of the plea agreement. Healy said it's likely that Rolater will face civil lawsuits from customers. Healy also noted that Rolater is giving up fossils including the Tyrannosaurus skull, which Healy said was an exceptionally rare and valuable piece. Rolater told Skavdahl that the Tyrannosaurus skull he was giving up was worth at least $250,000. The federal government has sought forfeiture of the skull in a separate federal court in Colorado. Healy said after the court hearing that Rolater's agreement to give it up may make that case unnecessary. The federal investigation into Rolater's operations began in June 2012 when federal officials received a tip that the Tyrannosaurus skull in his Jackson gallery came from Mongolia, according to a statement the Denver office of Homeland Security Investigations issued after he entered his guilty plea in January. The skull disappeared from Rolater's gallery after news reports that the agency had seized a separate Bataar skull in New York, according to the Homeland Security Investigations statement. Federal authorities in May 2013 returned the 70-million-year-old Tyrannosaurus skeleton to the Mongolian government. The repatriated skeleton had been looted from Mongolia's Gobi Desert and illegally smuggled into the U.S. by fossils dealer Eric Prokopi, authorities said. Prokopi, who bought and sold dinosaur skeletons out of his Florida home, pleaded guilty in late 2012 to smuggling dinosaur fossils into the United States. He is awaiting sentencing in federal court in New York. Healy told Skavdahl that the federal prosecutions of Rolater and Prokopi both brought the issue of federal prosecutions for fossil smuggling to public attention. Before those cases, Healy said, fossil dealers operated with a "head-in-the-sand syndrome." They knew there might have been some illegality about how fossils got into the country, but decided that once they were in the United States it was all right to trade in them, he said. Crank said there have only been a few federal prosecutions on fossil-smuggling charges nationwide. The status of the law in China and Mongolia is unclear whether fossil exports are permitted or, if not, how long they have been prohibited, Crank said. Houston lawyer Robert Painter represents the Mongolian government in trying to reclaim fossils that have been smuggled out of that country. "The Mongolian government is very grateful for the cooperation of the justice system here in the United States," Painter said in a telephone interview Tuesday. "Our goal is to see these fossils that were illegally removed from Mongolia repatriated using the proper judicial process." The Mongolian government installed the Tyrannosaurus it received back from the United States last May in a museum in the capital city of Ulan Bator, Painter said. More than 700,000 of the country's roughly 3 million people had seen it last year, he said. Help young women in Ulaanbaatar access support groups to learn to protect and advocate for their rights. Why we care: High rates of adolescent pregnancy, sexual violence, maternal mortality, and sexually transmitted infections in Mongolia threaten the health of young women. How we're solving this: Providing reproductive health services, support groups, and education for young women, so they can protect their health. In Mongolia, nearly half the population is under the age of 20. Adolescent girls, particularly in isolated rural areas, face high risks of contracting sexually transmitted infections (STIs), becoming pregnant, and experiencing sexual violence. With these obstacles, fewer women graduate from school, enter the work force, and gain leadership positions in their communities or nation. The "Princess" Center for the Protection of Girls and Young Women's Rights—located in Ulaanbaatar, Mongolia—knows how critical it is to provide young women with accurate reproductive health information and services so they will never have to face these threats. · Mentor and emotional support clubs that meet monthly and provide education on pregnancy prevention and protection against STIs, and counseling to help women overcome trauma from violence. · Trainings for young mothers on sexual health will teach women about their sexual rights, STI/HIV/AIDS, parenting, and self-confidence. · Vocational and life skills training for young mothers to gain economic independence. · Awareness raising campaigns and theatrical performances to provide opportunities for women to voice their experiences as teen mothers. · A women-run counseling hotline to provide support and advice to women survivors of violence. · Social work and fundraising training to young women university students preparing them to provide excellent counseling to young mothers and mobilize more resources for critical reproductive health services. The Princess Center offers women the skills, knowledge, and support required to create social change that will put an end to violence and early pregnancy. Ulaanbaatar, March 23 (MONTSAME) The Mongolia National Lesbian, Gay, Bisexual and Transgender (LGBT) Dialogue was held March 20-21 in the UN House in Ulaanbaatar. The LGBT Dialogue brought together 80 representatives of various stakeholders, including Government officials, LGBT human rights advocates, civil society activists, researchers and academics. The Dialogue was organized as part of the regional 'Being LGBT in Asia' initiative being undertaken by UNDP Asia-Pacific Regional Centre and USAID Regional Development Mission Asia, both based in Bangkok, Thailand. In her opening remarks, UN Resident Coordinator Ms Sezin Sinanoglu acknowledged the initiatives taken in Mongolia in the past years in protecting LGBT rights: the Pride Week and DemoCrazy Carnival organized in 2013 were innovative ways of raising awareness among the general public, while various research studies, including the study conducted by the NHRCM and submissions to UPR on LGBT rights, contributed to bringing LGBT issues to the attention of policymakers. The Minister for Culture, Sports and Tourism Ms Ts.Oyungerel shared the story about the legal registration of the first LGBT organization in Mongolia, and stressed that LGBT issues need to be mainstreamed in every sphere of human life, including culture, sports and tourism. She also highlighted that enhancing acceptance and understanding of family members and friends of LGBT persons is an issue of culture, which needs to be addressed. Participants of the Dialogue discussed health, education, employment, family, media and culture related issues that LGBT people face, achievements, and opportunities to make positive changes in legal and social environment that promote human rights of LGBT people. For example, in the education sector, it is remarkable that younger generation now has much better sexuality education than the previous generations; however, teachers need more training to teach sexual orientation and gender identity. Health issues of transgender girls and women are not researched at all. Employers are reluctant to hire transgender women, simply because of their appearance. The U.S. Ambassador to Mongolia Ms Piper Anne Wind Campbell released the following statement before the Dialogue: "I commend Mongolia on hosting this National Dialogue promoting the human rights of LGBT persons. There are many in Mongolia who are committed to ensuring that LGBT people are able to exercise their human rights without interference. This dialogue is an important step in that process - to identify the challenges that the LGBT community faces and provide recommendations to improve the social and legal environment here in Mongolia. President Obama has made it a diplomatic priority for the United States to promote and protect the human rights of people who are LGBT, and we at the U.S. Embassy are committed to working with the Mongolian government and the LGBT community to work towards a future without discrimination." The dialogue will feed into a report on the situation of LGBT people in Mongolia. This report will then inform a regional dialogue on LGBT issues to be held in Thailand in June 2014. It is also hoped that the dialogue and the report will better inform LGBT human rights programming in the future in Mongolia. March 25 (infomongolia.com) Mongolian State University of Agriculture (MSUA) and Missouri State University (MSU) have established an Agreement of Cooperation in Ulaanbaatar on March 24, 2014. The document was signed by Associate Vice President for International Programs Mr.Stephen Robinette representing MSU and Mrs. Kh.Altantsetseg, Professor and Vice Director of the Division of International Cooperation at MSUA. In the frameworks, two universities will partner in scholar and cultural exchange programs, besides to implement bachelor degree programs under 3+1 and 2+1+1 systems, which means MSUA students will study 3 years at their school and complete the last year program at MSU, and the second option is to study 2 years at MSUA, 1 year at MSU and 1 year at MSUA. Missouri State University is a public university located in Springfield, Missouri, United States and founded in 1905 has 85,000 alumni applying their education around the world and 1,500 international students studying on the Springfield campus. March 24 (The Asahi Shimbun) A once-skinny kid from Mongolia who initially dreamed of playing professional basketball has traveled a long and bumpy road in Japan. But on March 23, Kakuryu elevated himself to the top of the sumo world. The 28-year-old easily dispatched fellow ozeki Kotoshogiku to finish 14-1 in the Spring Grand Sumo Tournament in Osaka and capture his first Emperor's Cup. The Japan Sumo Association has indicated that it will formally promote Kakuryu to yokozuna, sumo's highest rank, during a meeting March 26 of its promotion committee. "I will work hard to become the kind of wrestler who can make everyone happy," Kakuryu said in an interview after his final bout, as shouts of "yokozuna" rang through the crowd. He later said: "I will devote myself even more because a yokozuna must always dominate the ring." Early in his life in Mongolia, Kakuryu saw his future career in hoops. But at age 14, he watched a live TV broadcast of compatriots Kyokutenho and Kyokushuzan competing in a grand sumo tournament in Japan. He was so impressed with their skills that he decided to devote himself to sumo. Unlike the Mongolian yokozuna trio of Asashoryu, Hakuho and Harumafuji, Kakuryu did not have a father with a sumo background. His dad is a dean at a national technical university. The young and ambitious Kakuryu wrote a letter about his sumo dream and had a friend of his father translate it into Japanese. He then sent copies of the letter to several sumo stables. The letter caught the attention of Izutsu, who eventually became Kakuryu's stablemaster. Kakuryu knew he had to gain weight. When he first arrived in Japan, he weighed only 65 kilograms. When he saw Kakuryu for the first time, Izutsu said, he thought he would have to make him the stable's "tokoyama" (hairdresser). Many bowls of "chankonabe" have helped Kakuryu bulk up to 154 kg. In addition, he frequented sushi restaurants to get used to eating fish, which is considered sacred in Mongolia. Kakuryu made his sumo debut in 2001, but not everything has gone as planned. He was twice demoted from the sandanme division to the second-lowest jonidan division. It took him 17 tournaments to win promotion to the fourth-lowest makushita division, an unusually slow process for a future grand champion. He finally won his first Emperor's Cup in his 74th basho. Along the way, Kakuryu has learned how to speak Japanese, English and Russian. Kakuryu's long struggle to reach the pinnacle of the sumo world has been worth the wait, and no one is prouder than his dad. "I have been waiting for (this moment)," said Kakuryu's father, while giving his soon-to-be-yokozuna son a big kiss on the cheek. March 24 (infomongolia.com) The 2014 Challenge Cup of Asia was successfully organized in Abu Dhabi, the United Arab Emirates (UAE) on March 15-22, 2014, where Mongolian ice hockey team has been participating since 2009 and for the second time wins Bronze medal in the 2014 edition. We have reported the first two games' results and on March 19, Mongolian team had its third game against the team of Kuwait winning by 3:1, on the following day, March20, our team secured Bronze medal winning over the team of Thailand by 8:2. In the Silver medal contest held on March 22, Mongolian team played against the host nation UAE, however the teams tied with a score of 1:1 after second period, but our players missed two goals in the last period. The team of Chinese Taipei defended their Championship title and the UAE team with 3 wins becomes runner up in the 2014 Challenge Cup of Asia, where six teams of Chinese Taipei, Hong Kong, Mongolia, Kuwait, Thailand and the United Arab Emirates have competed in round-robin system. BOONE, March 24 (Appalachian State University) —Cameron Batchelor of Raleigh, a junior geology major at Appalachian State University, has been awarded a $2,000 Youth Activity Grant from the Explorer's Club in New York City to conduct fieldwork in Mongolia this summer. Batchelor's project is titled "Absolute Age Dating of Zircons of Devonian Samples Collected from Central Asia Samnuuruul Formation." She will work with Assistant Professor Sarah Carmichael and Professor Johnny Waters from Appalachian's Department of Geology. "The Explorers Club grants are highly competitive and only a small percentage of the proposals are funded," wrote Youth Activity Fund Chair Marla D. Daily. Waters is co-leader of a United Nations-sponsored research team that has found evidence in Central Asia for catastrophic oceanographic events associated with climate change and a mass extinction that devastated tropical marine ecosystems 375 million years ago. Under Carmichael's supervision, Batchelor has assisted with the U.N. team's research by analyzing the geochemistry of the rock samples taken from field sites in western Mongolia that were once part of the ocean floor. Age dating of zircons will be conducted at UNC-Chapel Hill in Dr. Drew Coleman's laboratory in the Department of Geosciences. "As a National Fellow of the Explorer's Club, I can testify firsthand that the competition for student grants is intense," Waters said. Most Germans have a positive attitude towards Buddhism. They associate it with the Dalai Lama, a friendly, elderly man who sometimes holds lectures (like in Frankfurt on May 14), and presents Chancellor Angela Merkel with silk scarves on TV. According to estimates from the German Buddhist Union, the umbrella organization of the Buddhist communities in Germany, there were about 250,000 Buddhists in Germany in 2008, 125,000 of whom were German citizens. There are Buddhist centers in many German cities in which meditation classes are held. So with Tibetan Buddhism being the predominant religion in Mongolia, and me being a religiously interested person, I was quite curious about the Buddhist sights in UB. Here's my short review of the sights I visited and my experiences there. To get an idea of the theoretical background of Tibetan Buddhism, I first went to the Choijin Lama Temple Museum. Although the roof of one of the weather-beaten temples of the museum can be seen from Sukhbaatar Square, the museum's entrance was not easy to find. With the help of some friendly locals, I finally got to the ticket office. Equipped with an audio guide, I entered the museum. At the entrance gate I detected four ferocious fellows that I would have allocated to Hinduism rather than Buddhism. Obviously, Buddhism is far more complex than portrayed in the books that I've read on the topic. What was also new to me was the fact that in addition to the admission ticket, you have to buy a permission card if you want to take pictures. In turn, there is little promotion of the museum shop nearby with postcards and souvenirs; that's definitely different from Germany. Declaredly, most of these souvenirs, once bought, just collect dust; but they are a great success with teenage students who buy definitely everything after they have endured a guided tour. Nevertheless, I liked the museum. It colorfully shows the richness of Mongolian Buddhism. The Fine Arts Zanabazar Museum, which I went to next, had some more new experiences and information ready for me. I again rented an audio guide and made my way through the exhibition halls. When seeing all the Sarasvatis, Yamantakas, Rahus, White Mahakalas and the twenty-one different Taras, I felt slightly overstrained. For someone who is familiar with this vast pantheon of deities, the exhibits are fairly interesting; but as this was all quite new to me, I would have loved to have a basic introduction to the pantheon. The first thing I recognized on my way up to the temple complex was the loud coo of hundreds of pigeons. In fact, the whole place was covered by them, supported by the vendors that sell birdseed. Except for the pigeon fanciers, who have diminished in the past years, pigeons are not that popular in Germany. They are sometimes even called the "rats of the air", as they spoil the buildings. Here, their constant noise in the background is somehow calming. The whole site emanated a laid-back and friendly atmosphere. Nevertheless, I always feel a bit shy when entering the holy sites of foreign religions. Faith and its practice is something very personal, so peeping into the temples and buildings, I felt like an intruder into a different world. It was very fascinating to observe the monks reciting verses. Obviously, they didn't mind me standing there. One of them grinned, the other pulled the ear of a younger monk who was not concentrating enough. The 26 meter high Buddha statue, the Migjid Janraisig Sum, is the temple's impressive main attraction. Nevertheless, as a foreign tourist not familiar with Buddhism, I would have wished for someone who could have taken me by the hand and explained the rites of the monks and the meaning of the paintings, silk embroideries and statues within the complex. If there are any specialized guided tours available focusing on Buddhism, they should definitely be promoted more. To experience Buddhism personally, I finally went to a meditation class. This was, in fact, my personal highlight of the journey to learn more about Mongolian Buddhism. The meditation was public, with some explanation in English. Being slightly late, I entered the well-attended room. The people, most of them Mongolian, were already sitting cross-legged on cushions. I followed after them. When it was a quarter past six, I wondered if the meditation had already begun without me noticing. Nevertheless, there were still people entering the room, and some texted on their mobiles. At 6:30 p.m. a monk came in to light a candle. To my surprise it was a European-looking woman clad in a bright orange robe who gave the short introduction to the meditation. If Germans think about meditation, they generally think about something relaxing – you know, sitting around, doing nothing with your eyes closed. Well, I was disabused. First, my left leg fell asleep. Then, my back started to hurt. As the monk had announced, to concentrate on one's breath isn't that easy – at least if your leg feels like it's being intruded by an army of ants and the man in front of you is wearing a green t-shirt with the tour dates of an unknown rock band on it. As I discovered, UB is a good place to experience Mongolian Buddhism. During my different encounters, I recognized that there is much more to discover to Buddhist religion than I had expected. In any case, I will attend the meditation class again next week. Former Wonga Beach resident and regular Newsport contributor, Steve McKechnie reflects on his amazing experiences living and working in Mongolia. March 24 (The Newsport Daily) After nearly three and a half years here I will be moving onto the next challenge after a bit of down time in North Queensland to recharge the batteries and thaw out a bit. I can honestly say I will miss Mongolia, so I thought I would spend a bit of time trying to analyse exactly what it is about Mongolia that has captivated me and what I will miss the most. One of the great things about Mongolia is also the thing that turns a lot of people off coming here. It is big and empty. There are about 2.8 million people here which is far less than Melbourne, or Sydney and with a land mass pretty close to the size of Queensland. You start to get a feel for how remote and isolated parts of Mongolia are. Especially when you consider that out of the 2.8 million odd people, about 1.5 million of them live in Ulaanbaatar. That means the rest of the country is about as empty as the NSW State of Origin trophy cabinet. This was really driven home to me when I was fortunate enough to ride in the inaugural Gobi gallop across the South Gobi with five other expatriates last year. There are not many places in the world where you can ride 700 kilometres without crossing a bitumen road or having to go around a fence or through a gate. The down side to the emptiness is that there is very little infrastructure outside of the main towns. The roads are generally no more than a dirt track heading off into the desert or hills, accommodation is in Ger's and the long drop toilet is considered a luxury. Make sure you take your own toilet paper. For those who like a bit of adventure and don't mind roughing it a bit, exploring the mountains, the Steppe and Gobi Desert area by 4WD, horse or camel is a fantastic experience. The landscape is ever changing and very diverse. From the high peaks where the snow never melts to the great expanses of the South Gobi that seems to go on forever, to beautiful rivers like the Tuul flowing through valleys that are lush and green during summer and frozen solid in winter. I will miss the Mongolian people, particularly the people I have been fortunate enough to interact with outside of the city. The traditional Mongolian is a very proud person, proud of their heritage and proud of their culture. Even in a city Ulaanbaatar, where you would expect the day to day rat race over, the old traditions and culture are still visible everywhere. I will miss Ghengis Khan being a part of everyday life. I will miss the throat singing and hearing the Morin khuur or horse head fiddle being played. I will miss the tough little Mongolian horses who have carried me over some of the most remote parts of Mongolia, over mountains, through half frozen streams, across frozen rivers, through sand dunes and stoney deserts and usually ended the day in a lot better condition than I did. I will miss some of the traditional food however my waistline will not. I have developed a soft spot for fresh khuushuur, a delicious meat dumpling and even salty milk tea on a cold day. I will not miss the lack of fresh fruit and vegetables we take for granted in far north Queensland. I will miss the occasional drink of Airag (fermented mares milk) more so because of the hospitality that goes with it being offered some than the actual drink itself. I will miss the festivals that the Mongolians celebrate each year such as the Naadam Festival in summer with the wrestling, horse racing and archery and the Tsagaan Sar winter holiday which is all about family and paying respect to the elders. I don't think I can honestly say I will miss the bitterly cold winters but I am no longer scared to go for a walk outside when it is minus forty degrees celsius. These days, I don't even bother with a jacket unless it is at least minus five. I won't miss the pollution or traffic in Ulaanbaatar which is officially one of the most polluted cities in the world and has some of the worst drivers I've ever encountered. I will miss the annual camel polo tournament with the majestic Bactrian camels and traditionally dressed riders and the annual eagle festival. I will miss seeing the traditional Mongolian costumes of deels and curled up boots. I will miss all of the Mongolian friends I have made. I will miss saying 'Saen Baenu' and 'bayarlalaa' and having them laugh at my Mongolian. I won't miss the concept that when the plane lands safely everyone claps as if it is a major accomplishment and not something to be taken for granted. I will miss 'The children of the Peak', the charity I have been involved with, looking after the children and families who eke out a living scavenging at the rubbish tip through winter. I will continue to support them from afar. I will miss all the fantastic photo opportunities I have had over here. I will be sorting through the thousands I have taken to select some of my favorites for the wall. In some respects I will not miss the Mongolian concept of punctuality and sticking to a schedule. That said, I'm sure when I'm stressed and sick of the rat race I'll reflect on the quieter times I've had in Mongolia and really question who has the right priorities. I will miss Mongolia very much. It is the sort of place that, despite its hardships and problems, continues to hold onto its heritage and culture while finding the balance that being part of the developing world creates. If you have thought about visiting Mongolia, go with your eyes open and it will be a trip of a lifetime.